The team from Embecosm and University of Bristol (Sans-Andrew) who helped at the Energy Efficient devroom and stand. 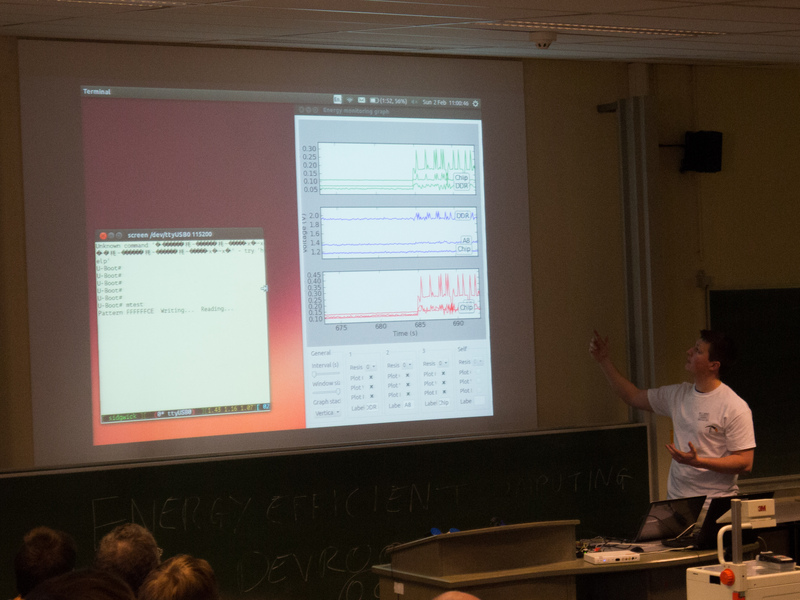 On January 2nd, as part of our community engagement, we hosted the Energy Efficient Computing developer room at FOSDEM 2014 in Brussels. 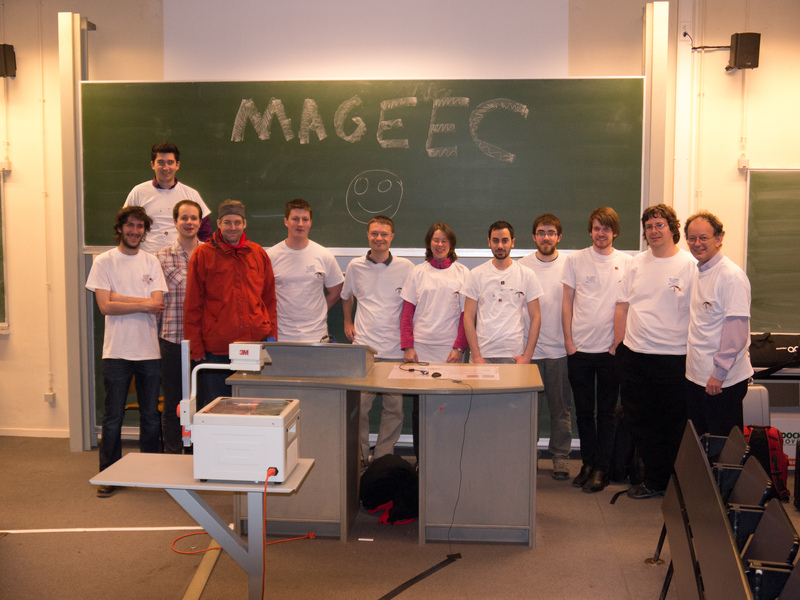 At which members of the MAGEEC team and others shared details of the latest developments in measuring and reducing the energy consumed by computer systems. The day started off with Jeremy Bennett giving a recap of the main track talk that he and Kerstin Eder had given the previous day — “Who ate my battery?”— to set the scene for the talks that would follow. These included a background to energy measurement from Simon Hollis, a talk on the MAGEEC energy measurement platform from James Pallister, and a broader introduction to MAGEEC from myself. James Pallister talking about how to use the MAGEEC energy measuring boards. My talk marked the first discussion of the concepts and implementation of MAGEEC given to developers outside the compiler specialty; most talks up until now have been given at conferences such as GNU Tools Cauldron and LLVM Developers Meeting. There were questions after the talk on similar work in this area, and I’m pleased to say that our work was well received, with a general view that what we are doing is particularly interesting by nature of being universally applicable to virtually all architectures and compilers. A link to the talk will be added once it is available. Not that the entire dev room was about MAGEEC and other talks covered numerous aspects in the field of low energy computing. Kyriakos Georgiou and Neville Grech spoke about ENTRA, which aims to produce energy information as part of compilation, similar to how code size is currently provided. David Greaves from University of Cambridge Computer Laboratory gave a talk about spEEDO, which links energy data with debugging info, in order to report energy usage in systems. Emilio Monti spoke about the low energy mbed platform, and Hayden Field and James Pedlingham spoke about EACOF, which combines energy data from multiple sources, presenting it to a program or user in a usable manner. Steve modding a Beaglebone Black for energy measurement. In the middle of day we ran a workshop which allowed delegates to get hands-on with the energy measuring hardware and enabled them to see for themselves how the software they develop affects energy consumption. At the end of the 3 hour workshop we gave away 50 energy measurement kits and encourage their new owners to put them to use in creating energy-efficient software. And of course, it wouldn’t be a proper open hardware workshop without some hardware being hacked! To accompany the dev room and to increase awareness of the project, we also ran a two-day stand focusing on MAGEEC and other low-energy projects at Embecosm and University of Bristol. 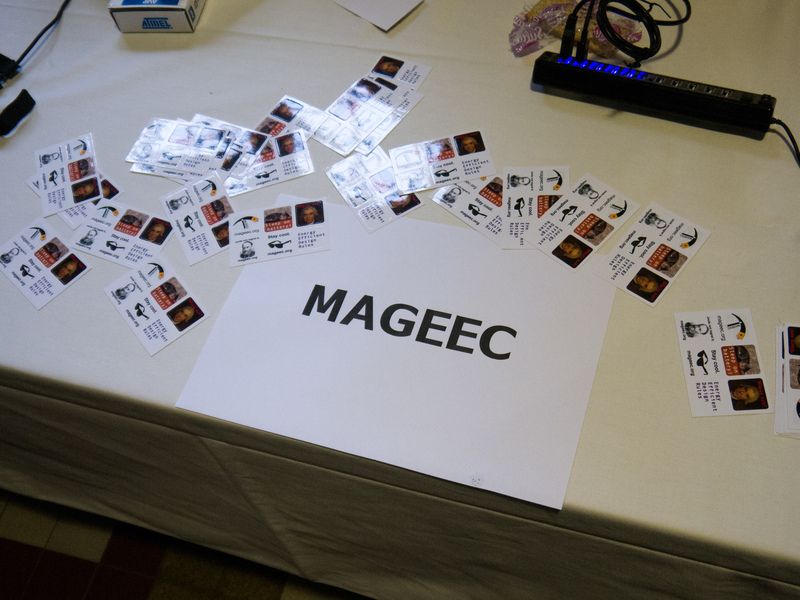 At the stand we gave demonstrations of the energy measurement boards and members of the MAGEEC team were on hand to discuss software energy consumption in general. 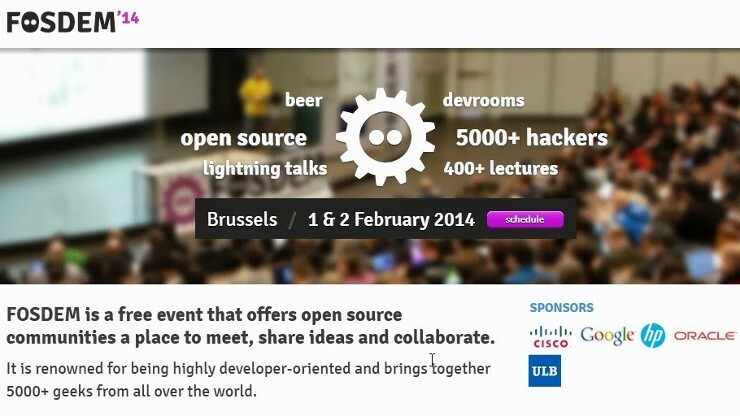 Overall, as an open source software and hardware project, FOSDEM was a natural fit to discuss the project and concepts at large, and we are delighted with the response we had both over the course of the weekend and follow up discussions since then via e-mail. This forms just part of our plans for making energy-efficient computing a talking point, and enabling people to measure energy consumption and to make their software use less energy. We will be participating at more events and will share details as soon as our plans develop. Copyright © 2019 MAGEEC. All rights reserved.